We are under way in the North Atlantic, north of Cape Ann en route to Portsmouth, New Hampshire. We spent the last four nights anchored in the Weymouth Back River, in the town of Hingham, Massachusetts (map). 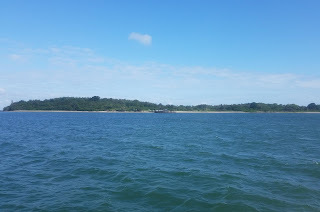 Just north of us was Grape Island, part of the Harbor Islands National Park, and Park Service ferries stopped by daily to drop off and pick up hikers and campers. A four-night stay for us usually signifies an interesting stop where we spent some time ashore exploring and dining out. In this case, however, that's a long way from the truth; in fact, getting ashore was nearly impossible and we ate aboard every night. The "south shore," as the area is known, is not a cruiser-friendly area. Sunset from our anchorage. Grape Island to the right, Weymouth Neck to the left, and Boston skyline in the distance. This part of the country is known for extremely restrictive boating laws, heavy maritime enforcement, and no-anchoring zones. In the few places where anchoring is not outlawed altogether, mooring balls predominate and make finding a safe spot a challenge. While we were anchored we we circled multiple times by police boats from three different municipalities (Higham, Weymouth, and Quincy). 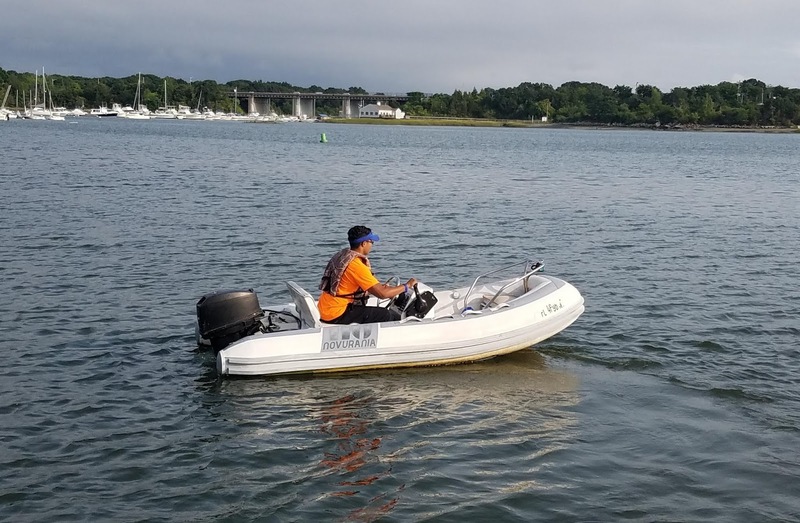 Marine patrols in New England say "Harbormaster" on them, but the harbormaster's office is part of the police department and these are sworn, armed officers. 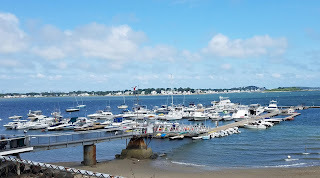 On our second day when one of the Hingham harbormaster boats came within shouting distance we had a chat and they agreed we were OK where we were, after warning us about the giant ferries. In fact, we'd been watching the ferries pass by us all day long. They are high-speed cats which run at 32 knots, making the commute trips from Hingham/Weymouth to Boston and back multiple times each day Other than one, this morning, who had to wait for an available berth, the ferries stuck to the marked channel and did not come close to us in the anchorage. The channel here is posted No Wake and the ferries slowed down from their running speed half a mile before reaching us. 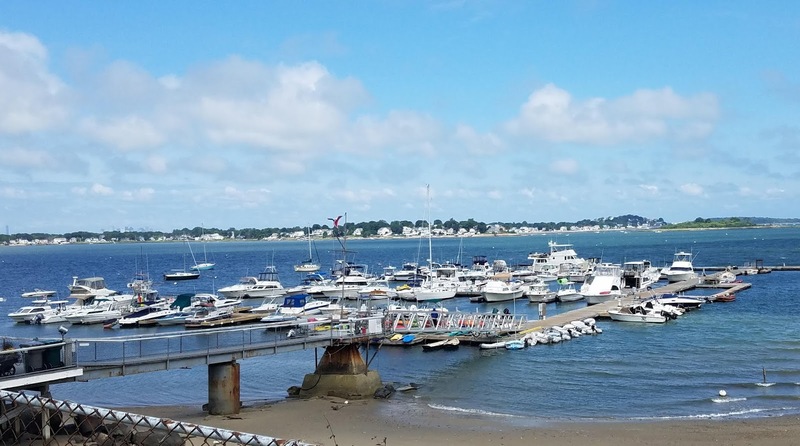 The reason we were here at all is because the Highfield Aluminum Boat dealer for the greater Boston area is here in Weymouth, Monahan's Marine. They happened to have the exact model and configuration in which we were interested already assembled and in their showroom, and we wanted to check it out first-hand, rather than have to order one built-to-order. 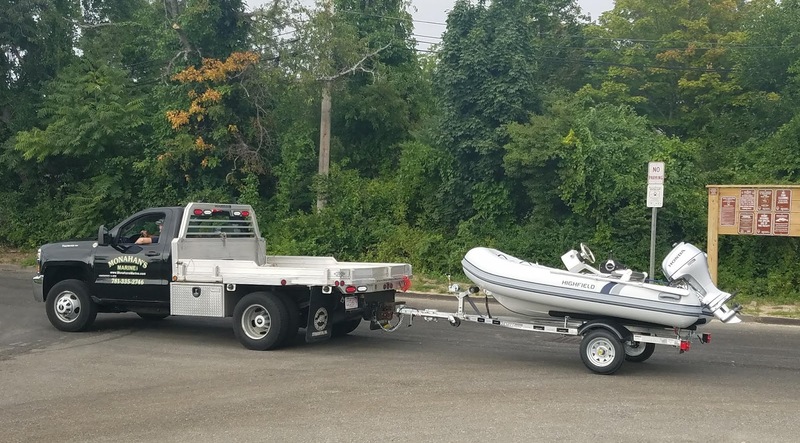 This sort of in-person visit is what dissuaded us from buying the smallest model jet tender when we looked at it in Sag Harbor. Grape Island and the park service dock from our anchorage. The dealer was closed Sunday and so I spent a good part of the day figuring out how to get ashore and get to the dealer. I found only a single marina with a dinghy dock, and they wanted $20 for a maximum of three hours. Other than that same dock, adjacent to the ferry landing at the old Bethlehem Hingham Shipyards, there was not even anyplace to land for dinner. We would not have even come in a full day early, on Saturday evening, had it not been for the weather. And we were very glad we were well anchored and hunkered down; winds Sunday were 30 knots, even in the anchorage. We were well protected there, and had just chop but no real discomfort. Meanwhile we heard a radio call where a harbormaster picked up a paddleboarder in Boston Harbor in six-foot seas. In the harbor! Monday morning during business hours I radioed the Wessagusset Yacht Club, a couple of miles away in the Fore River. Our directory said we had reciprocity and it looked like day dockage for guests was free, so we asked if we could tie up. The lone dockhand on duty seemed a bit unsure but said it was OK. So we weighed anchor, motored over, and wrestled the boat to the day dock in 20 knots of crosswind. Fortunately that dock was a heavy concrete floating dock, which serves as the breakwater for the rest of the marina. We were the biggest thing there by a wide margin. Pat the dockhand helped us tie up, and without him to place lines in that kind of wind we could not have done it. I asked him a few questions and for permission to offload a scooter. Apparently he is alone all day on Mondays, when the bar and restaurant are closed. Vector at the Wessagussett Yacht Club in Weymouth. We came in at half tide and falling, and were relieved to find 20' under the keel, since the tide swing here is a full ten feet. With 20 knots of wind trying to push us off the dock, and plenty of reversing current in the river, we doubled up all lines before leaving the boat. After scoping out the convoluted path from the dock to the street, we opted to leave the scooter on deck, and we grabbed a Lyft over to the dealer, carrying the enormous box with the old chartplotter that I needed to get to FedEx. The dealership was very pleasant and the boat was exactly what we needed. Buying new, or from a dealer, is never my first choice, but in this case we were willing to make an exception, for two good reasons. 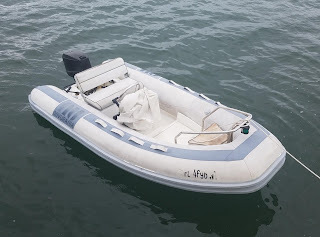 First and foremost was the fact that we can't sail away with two dinghies -- whoever sold us a new dink would have to take the old one off our hands, which rules out most private sellers. And second, the model we wanted is relatively new to the market, and used examples are scarce. After test-fitting ourselves in the seat and at the controls and a thorough inspection of the boat, we decided to buy the one in the showroom. The dealer knocked $500 off the price, but was only willing to take the old one off our hands for disposal. After some pressure he agreed to see if any wholesalers wanted it and he would give me whatever they gave him, less expenses. Given the number of issues with the old tender, that was not entirely unexpected. At 17 years old, with leaking tubes, a delaminating rub rail, dings in the fiberglass, and a 15-year-old two stroke motor that needs a new prop, new tilt tube, and new latch, it would cost a dealer more than the boat is worth just to fix it enough to sell it. Still, it was disappointing. 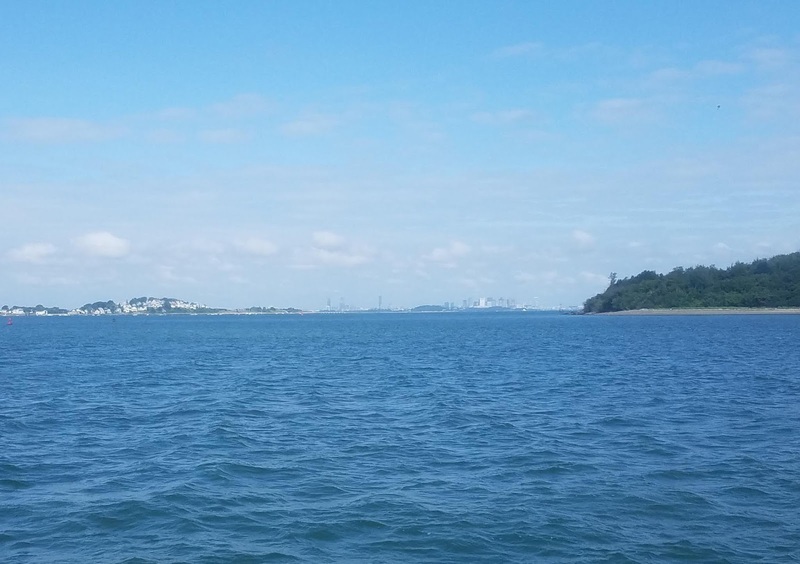 Boston skyline, nine miles away, from our anchorage on a clear day. Other than no way to get ashore, it was a lovely spot. The dealer would not take a personal check, and would also not put the whole deal on a credit card without us picking up the card fees, so we agreed to wire the money. They agreed they could have the boat prepped and at the boat ramp in the afternoon. We closed the deal and headed over to a shopping center via another Lyft to drop off my package and pick up a few groceries. A third Lyft got us back to the yacht club, where we had a bit of a wait for young Pat to let us in, as we was out in the launch shuttling members around from their moorings. As we made our way down the dock we chatted with a couple of the members and asked if they knew anyone who needed a tender. Hey, couldn't hurt. It turned out that Pat himself, whose dad has a slip at the club and whose sister also works as a dockhand there, was interested in the boat. 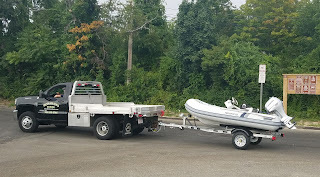 After about fifteen seconds of thought I agreed to sell it to him for $200, so long as he could meet us at the boat ramp at the exact time the dealer delivered the new boat. We waited at the dock the rest of the afternoon for the wind to subside a bit before shoving off and heading back to the anchorage. Wiring the money turned out to be the fly in the ointment. Our "regular" bank, Chase, would not do it, and so we had to go to our brokerage account. They could do the wire but not until the next day, and since they are on the west coast, that really meant Tuesday afternoon. Even then, we had to push them. Penultimate photo of Scalar, stripped of everything we could keep. I spent all of Monday afternoon and evening, and all of Tuesday morning, emptying out the old tender and removing equipment we wanted to keep, specifically the chartplotter/depthsounder and the VHF radio and antenna. The radio broke on removal, with the antenna connector badly corroded in place, and we'll not be replacing it, opting for one of our handhelds instead. But the plotter and sounder are requisites. The wire ended up taking all day, with the transfer from our bank happening at 1 pm but the funds not arriving in the dealer's account until 4:30. They close at 5 so we were really sweating it by the end of the day, worried we'd have to leave town without our new boat. The dealer graciously delivered the boat to us after 5 at the ramp, and Pat met us there shortly after the boat arrived. Our new dink arrives at the boat ramp. It was a bit sad to watch Scalar motor off into the sunset, but I am glad at least that someone will fix it up and use it, rather than it getting parted out and sent to the breakers. Pat reported that he made it home just fine, a relief considering we left him no paddles or anchor. 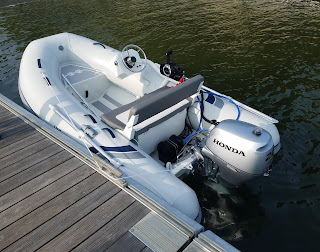 We had a little drama of our own, however, with the new Honda stalling a hundred feet from the dock. The new boat came with oars, and we paddled vigorously back to the ramp and called the dealer. Most likely air trapped in the fuel lines, although I think the throttle and idle may need some adjustment. We eventually got it going and made it home without further incident. Young Pat motors away in Scalar. After a celebratory beer we hoisted the new boat on deck. I will have to make some changes to the chocks to get it to sit right, but we were able to jury-rig things enough to get back under way, with the new dink listing a bit to starboard in the old chocks. For the curious, the new boat is an Highfield CL310 with optional FCT console. It's about 10" shorter than our last boat, but some 200 lbs lighter, owing to an aluminum hull and a small steering pod rather than a full console enclosure. That will make for a rougher ride in heavy seas but a much easier time beaching and decking. Power is a 20hp Honda with power tilt, a real luxury. Our new tender, in the water for the first time. Unable to break the trip into two legs as we had hoped, today's cruise is a long one. 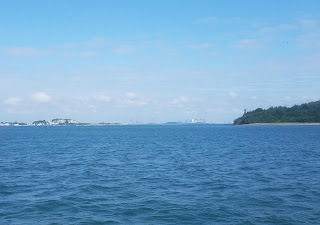 We had the anchor up shortly after 7am and threaded our way through the Boston Harbor Islands. Seas are not ideal today, and we bashed into four foot chop just ahead of the starboard beam all morning. 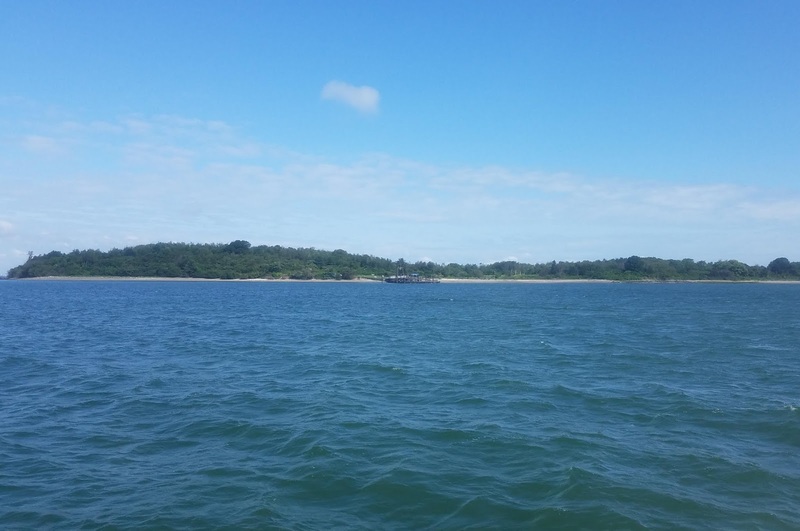 After rounding Cape Ann it's now on the starboard quarter and the ride is better. We should be in Portsmouth Harbor by cocktail hour, and we'll drop the hook someplace for the night. In the morning we have a reservation at the city docks at Prescott Park, right downtown, and my cousins will likely drive up from Chester to meet us. Fixing the chocks and setting up the new boat will have to wait until the weekend. She needs a name, too, and perhaps that will come to us over the next few days. Congrats on the new tender. Vector ... Scalar ... Gradient? 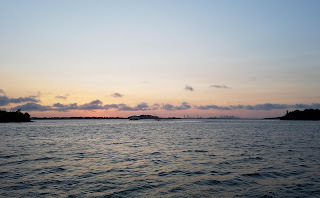 We ducked in to the bay near Hull to consider our options after a "peek" at the conditions Sunday morning and returned to Boston. It was ugly. Got out Monday afternoon. If we had only known Vector was so close...... oh well. I like the new tender, what does the total package weigh? Sorry we missed you. Dealer said 325 lbs plus fuel, but I need to do the math for myself to be sure. Our old dink was 560 on our crane scale, but that was with gear. Seems about right, since the boat alone is 132 lbs and the Honda is 104, which leaves 89 lbs for the steering pod / bench seat assembly. Sean, thanks for confirming our choice of new dink, we are in the process of picking up a new CL310 for Antipodes. By the way, the boat is in Ensenada for a minor refit/repaint with the major change being the replacement of our green hull. We are going all cream to cut the heat in the boat. Hope your cruising is going well.